Buy the standard, scholarly lexicons for both Greek and Hebrew together and save! Olive Tree’s editions of these texts provide even more features by turning cross-references to other words, and references to scripture into hyperlinks. Users of The Olive Tree Bible App can also take advantage of the “look up” feature with the resource, enabling you to jump from a parsed Greek or Hebrew Bible or an entry in another resource to the corresponding entry in BDAG or HALOT. The Hebrew and Aramaic Lexicon of the Old Testament (HALOT) is widely regarded as the standard scholarly reference on the language of the Old Testament. With articles on every Hebrew and Aramaic word, the complete vocabulary of the Hebrew Bible is arranged alphabetically (rather than by root), making navigation faster and easier. The Hebrew and Aramaic entries are in separate volumes, following the practice of most modern lexicons. All irregular forms are noted and most articles also contain cross-reference to other words built from the same root. Helpful word usage examples are found in the numerous cross-references included in the lexicon. 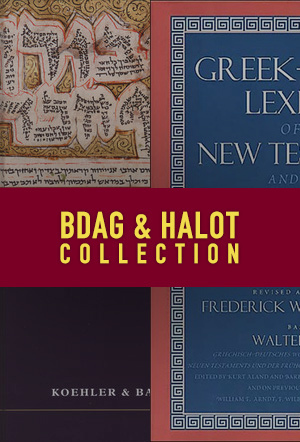 The essential lexicon for all students of Hebrew, HALOT greatly enhances the reading and study of the Old Testament.